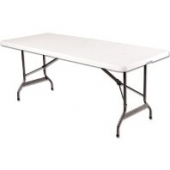 Below is additional information on the hire item "Centre Folding 6ft Utility table". Description Instantly create extra catering space with this strong and practical 6 ft fold away table. Ideal indoors or outdoors for buffets, parties, banquets and weddings. Space saving, easy to carry and simple to transport. Volume Price £ 9.20 for orders of 10 units or more.